August 15, 2018, Saitama, Japan – Tamron Co., Ltd. (President & CEO: Shiro Ajisaka), a leading manufacturer of optics for diverse applications, announces the presentation by the European Imaging and Sound Association (EISA) of its EISA Awards 2018-2019 to two Tamron lenses; 28-75mm F/2.8 Di III RXD (Model A036) for “EISA MIRRORLESS STANDARD ZOOM LENS 2018-2019” and 70-210mm F/4 Di VC USD (Model A034) for “EISA DSLR TELEZOOM LENS 2018-2019”. Model A034 also received the 2018 TIPA Awards for BEST DSLR TELEPHOTO ZOOM LENS. Tamron has been honored with EISA Awards for 13th consecutive years. 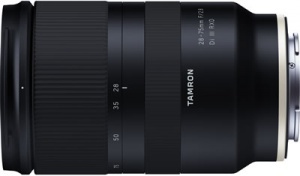 This Tamron is a high-speed standard zoom designed for full-frame mirrorless cameras. Compact and lightweight at just 550g, it is an excellent fit for small cameras such as the Sony α7 family. It is designed to produce enough detail for the newest high-resolution sensors, while the large aperture makes it easy to throw the background out of focus with a beautiful ‘bokeh’ effect. The fast, quiet autofocus motor is capable of keeping moving subjects in focus. Overall this lens provides very good performance at a highly competitive price. The receipt of this prestigious award marks the 20th year Tamron has won an EISA Award, and the 13th consecutive year since 2006.